-A great booklet on the life of Saint Gemma! 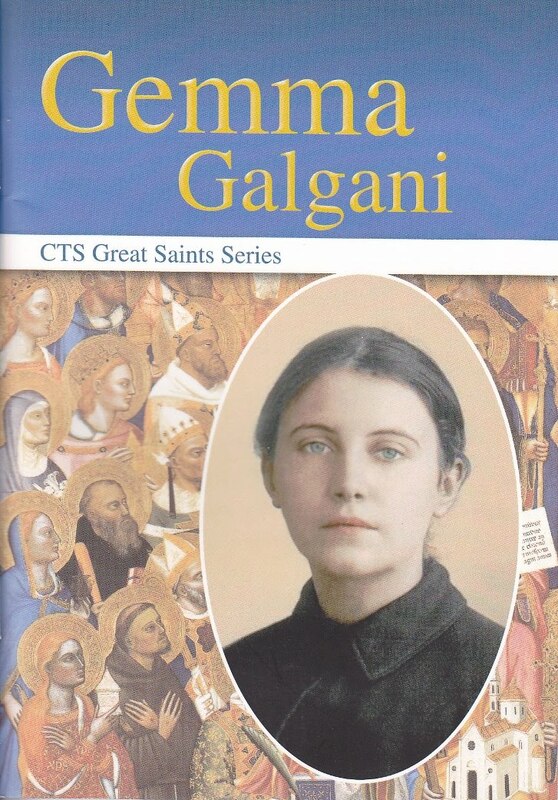 From out of Great Britain and the CTS Great Saints series comes a great booklet entitled “Gemma Galgani" Gem of Christ, by John-Paul Kirkham (Catholic Truth Society, 2011, 64 pgs.). 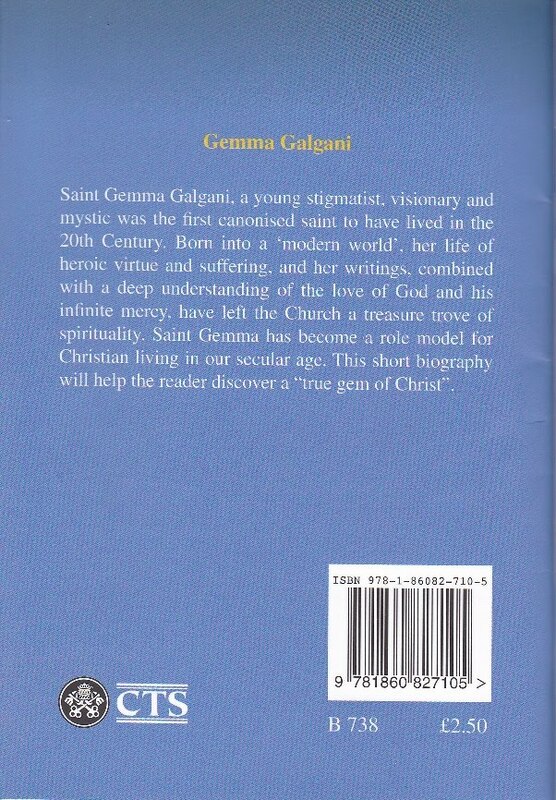 The booklet provides a concise biography highlighting the extraordinary life of Gemma, and includes a good number of quotes from the Saint. To continue with Mr. Kirkham’s intentions in writing the booklet, the publisher kindly granted permission to reprint the author’s introduction on pgs. 3-5 here, that it might give interested readers a foretaste of the booklet. The emblem of the Passionist Order displays a white heart and cross of purity. The cross over the heart indicating that hearts dedicated to Christ must expect to be at the foot of the cross and to be always united with it. 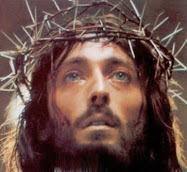 The words translate as "Passion of Jesus" and the three nails remind us of His suffering set against the black background as in mourning for the death of the Saviour. 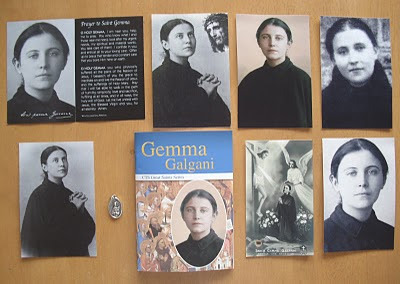 In the history of the Church it is rare for a saint to have shared closely in the Lord's Passion and one of the elect few is Gemma Galgani. Gemma is derived from gem, meaning a precious and beautiful stone. Gemma Galgani was the very first canonised saint to have lived in the twentieth century and till her death at the tender age of twenty five portrayed a fine image, despite her many infirmities. The art of photography was young but the many pictures and descriptions taken of her reveal a radiance of striking beauty. Unusually for an Italian her eyes, often raised to heaven, were a bright and piercing azure blue and her long hair soft brown. This young and vulnerable girl who lived her life hidden away in relative obscurity would eventually touch the lives of many. Orphaned of a loving mother at only seven years of age, Gemma matured quickly and rose to the highest state of sanctity that the church recognises. This humble servant of God became a mystic, visionary, and ecstatic and was allowed by Christ to unite with Him and suffer the wounds of His Passion by displaying the Stigmata and more as her physical heart would reveal after death. 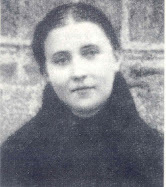 In reading this biography of St. Gemma some of the events will appear fantastic and supernatural but all of her mystical experiences and ecstasies were witnessed, recorded or transcribed by the church authorities under the guidance of her spiritual director the Venerable Fr Germanus, CP and have been well documented. This was a life that reached into the 20th century and touches our modern existence in a special way. Gemma was also instructed by her spiritual director Fr Germanus to write down her life from childhood to the age of twenty three and all of her diaries, letters and prayers survive as a testimony to a beautiful life consecrated to Christ. Her words were often addressed to Christ Himself and the Blessed Virgin. Gemma was often rewarded for her devotion with the gift of heavenly and divine visions and locutions with Our Lord, the Mother of God and her Guardian Angel. Throughout the book are many of St Gemma's own compositions which draw us closer to her profound and spiritual prayer life that displayed great sadness and yet immense and unconquerable joy. Many arduous illnesses would mean that Gemma's wish to enter various religious orders would always result in rejection. Towards the end of her shortly numbered days she urgently desired to join the Passionist Nuns of St Paul of the Cross but she was forced to remain a laywoman. However, as we shall discover, her prophetic words would strike true as she proclaimed "though you would not have me in life, you will in death". After her life ended her bodily remains were adopted by The Passionist's. Pope Benedict XV confirmed that "if not by habit and profession, undoubtedly by desire and affection, Gemma is rightly numbered among the religious children of St. Paul of the Cross". The booklet is being offered here for only $5.99 plus $2.50 shipping. Please be sure to enclose your mailing address. Please feel free to email me at gdallaire1@gmail.com if you have any questions. The booklet can also be obtained as part of the St Gemma website complete package offer, which includes all of the items that are offered on the website, including the four black and white St Gemma photo holy prayer cards, one St Gemma relic card, one color holy card, one prayer pamphlet, one medal, and one “Gemma Galgani" Gem of Christ booklet, all for $17 + $2.50 shipping worldwide ($19.50 total). Those interested can click here for more information on the St Gemma website complete package offer. This is a truly beautiful article about an inspirational young woman who truly felt Jesus in the very centre of her being. Thank you for creating this wonderful site and making St. Gemma available to us like this. I just wanted to let you know that I received the packet including the new booklet about the life of our dear St. Gemma! Thank you so much for your kindness. I enjoyed receiving everything in the packet! God bless you and your your family and also this wonderful website in honour of our dear St. Gemma!!! 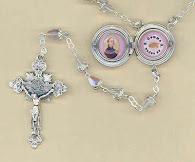 Thanks for you kind message and for letting me know that you received the St Gemma package safely. -I am really glad to hear that you are happy with it! I pray that St gemma may always be very close to you, and may she continue to lead you ever closer to Jesus and Mary! Thank you so much for the beautiful photos of St. Gemma and the booklet! I'm at a trying point in my life and can use inspiration from this miraculous woman to help better myself and become closer to God. I'd also like to thank you for this wonderful website. My first encounter with St. Gemma was on this site! Thank you Jessica! I am really glad to hear that St Gemma has inspired you, and I hope that she will continue to do so. And, I pray that she may always be very close to you. Thank you so much for this website.You gave me memories of my childhood, when i first heard from doctrine the life of this BLESSED lady.Iwish one day visit LUCCA or MADID whre this wonderful lady left he hearth.Im pround that my parents named me GEMMA.TKS again and GOD bless you always.We ll pray ST GEMMA for each other. Thanks for your comments. I am glad to hear that you are getting to know St Gemma beter. You are very blessed and fortunate to have her as your patron Saint! 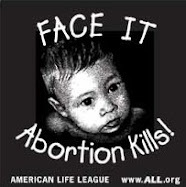 May God bless you and may Gemma always be your special friend and advocate! As stated at the bottom of the article, the booklet is being offered here for U.S. $4.50 plus $2.50 shipping =$7.00 total, (or $8.00 for those outside the USA). Simply click on the “Donate” button above. I WANT TO KNOW MORE ABOUT ST. GEMMA LIKE IS SHE INCORRUPT? To reply to your question, no, St Gemma ios not incorrupt. Her holy remians are kept in a life sized sarcophogus-urn inside the main altar of the moanstery Church of St Gemma in Lucca, Italy. As far as finding out more about Saint Gemma, well, as you can see there is plenty of information on this website to keep you reading for quite awhile!